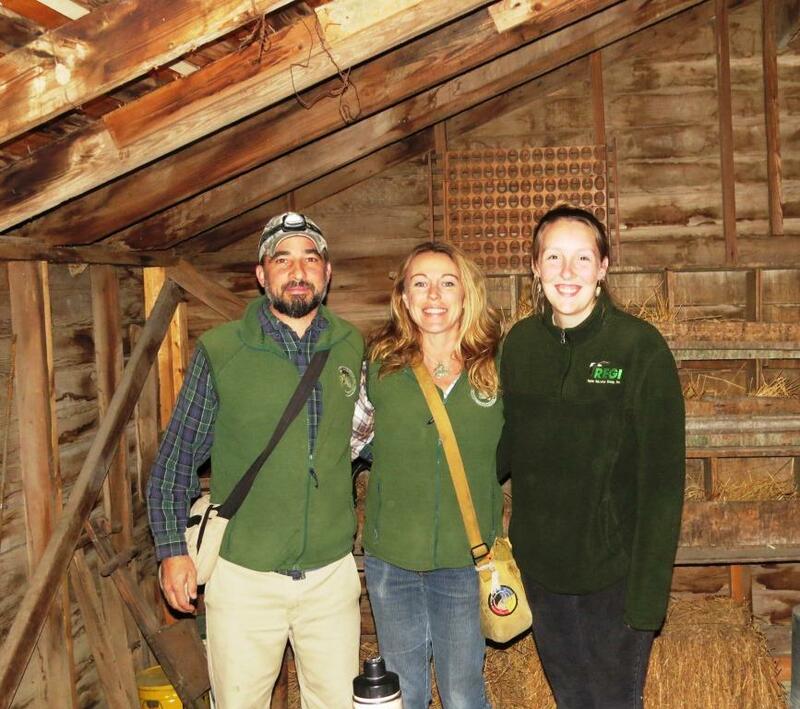 The author (center), Ethan Duke (MRBO co-founder & director) and Paige Witek (MRBO Education Coordinator) pose for a photo in the shed where they offer public programs about their Northern Saw-whet Owl banding program. 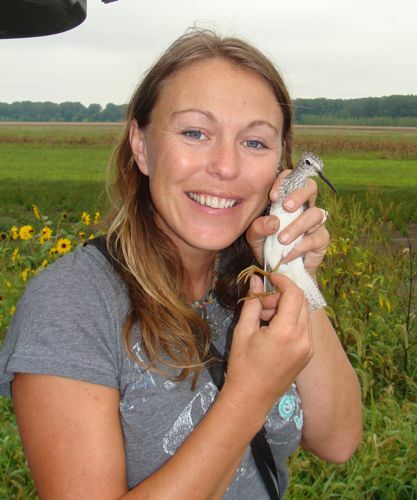 Dana Ripper, Director of Missouri River Bird Observatory, shares how her earlier career at Bird Conservancy is helping foster and support bird conservation in the heart of the Midwest. From 2005 to 2008, I had the honor of being the Prairie Partners Biologist for Bird Conservancy of the Rockies (then Rocky Mountain Bird Observatory; RMBO). The Prairie Partners program, which was conducted under the umbrella of Outreach and has evolved into today’s Land Stewardship program, then consisted only of Tammy VerCauteren, Seth Gallagher and myself. I learned an amazing amount from Tammy and Seth during my years with them, though it wasn’t until later that I realized just how much. I shared an office with Tammy as she underwent the transition from director of Prairie Partners to acting executive director of RMBO. I got to see firsthand how she organized and administered first the Outreach program and then the entire organization. Tammy and Seth provided training in everything from landowner interactions to writing large federal grants, and exhibited a degree of patience in their mentorship that I appreciate greatly to this day. In addition to giving me the wonderful opportunity to work within the Prairie Partners framework, RMBO allowed me to expand to helping with educational programs. Alongside RMBO Educators, I operated banding stations in Fort Collins and Scottsbluff, NE and provided educational demonstrations to visiting school groups. In 2008, I left Colorado for Missouri to pursue some new opportunities. No bird observatory existed there and the conservation framework and community in Missouri is quite different from that of Colorado. Recognizing a niche that could be filled, in 2010 my husband and I founded the Missouri River Bird Observatory (MRBO). While we were both biologists with many years of experience on a variety of different projects, we brought very different skill sets to this new organization. As it has turned out, my contributions to MRBO have relied heavily on experiences with Prairie Partners and RMBO’s education program. MRBO actually began in 2009 as a bird-banding station on the Missouri River to which we invited local school groups for demonstrations. My background with RMBO’s education program factored greatly into our decision to provide bird-in-the-hand experiences for people of all ages. Beginning in 2010, we began working with the Missouri Department of Conservation, U.S. Fish and Wildlife Service private lands program, USDA Natural Resources Conservation Service, Missouri Prairie Foundation and a number of other entities to implement bird monitoring programs in Missouri’s most imperiled habitats. These include tallgrass prairie, emergent marsh and bottomland forest. The vast majority of acreage in these habitats is under private ownership, which has provided MRBO with opportunities to work with ranchers, farmers, hunters and other individuals to conserve land for birds. Dana doing a marsh bird survey. My experiences with Prairie Partners were crucial to providing a foundation for private lands outreach and conservation. By working for Tammy and Seth, I was fortunate to learn how to network with a vast spectrum of partners, from individuals to regional Joint Ventures. This networking has been one of the keys to MRBO’s growth and modest success. It is still a small organization, but we have three full-time positions, including an Education Coordinator, and a seasonal staff of seven. MRBO’s co-founder and I carry out most of the landowner outreach work with the assistance of our on-the-ground seasonal staff. 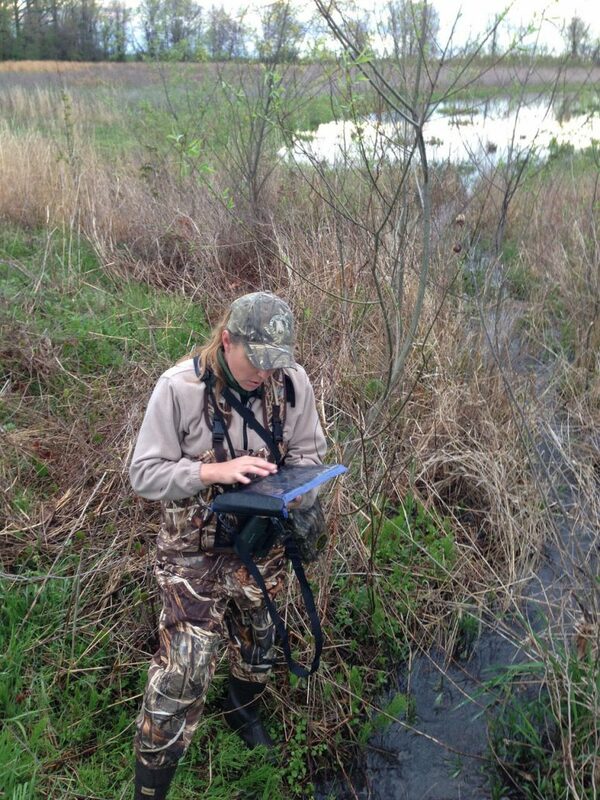 MRBO now conducts systematic, all-species transect surveys on tens of thousands of public and private acres each year. The organization also conducts more than 100 education events across the state annually, thanks almost entirely to our Education Coordinator. Kids experience a MRBO bird banding demonstration. In closing, I would like to note that, just like Bird Conservancy, our ultimate focus at the Missouri River Bird Observatory is conservation of birds and their habitats. In today’s political and cultural atmosphere, this is sometimes a tall order. I find it very heartening that Bird Conservancy and other bird observatories have remained strong and successful in their endeavors to not only conserve the land that birds and other wildlife need, but also to simply spread the joy and pleasure of birds to people from all walks of life. Dana can be reached via e-mail.